With swashbuckling escapades, piracy and intrigue, this out-and-out pantomime adaptation is a must! “Ready for some adventure”, says you? “Then heave to, me hearties, hoist the Jolly Roger and plunder that treasure”, says I. "And if a blood-thirstier buccaneer than this one-legged pirate ever sailed the seven seas, it be the devil ‘imself!" Yes, piracy is big box-office these days – and audiences are bound to lap up this true panto version of the sea-faring classic, with all the time-honoured ingredients of traditional pantomime, but a modern slant on the storyline, comedy and characters. So, climb aboard for this fun-filled adventure and prepare to set sail for the voyage of a lifetime! Many productions of this script have won NODA and drama federation awards, including Sparkwell Amateur Theatre Company, Devon. Aaar, Jim lad! Top o’ the mornin’ to you, Sir. Stand by to go about! Aark! What’s that you’ve got there, Mr Silver? Oh, this is old Cap’n Flint, lad. Oh, you’s heard o’ that black-hearted devil, ‘as you? Well, thank the Lord, I never ‘ad the misfortune o’ meetin’ the real Cap’n Flint, not I. But an old sea-dog who sold me this ‘ere bird swears blind it once were ‘is … so that’s what I calls ‘im. (Singing) Fifteen men on a dead man’s chest. Yo ho ho, and a bottle of rum! Oh, that’s a pirate song! Well, ‘e were a pirate parrot, lad! You can’t touch pitch and not be tarred, says I. Pieces of nine. Pieces of nine. Aark! 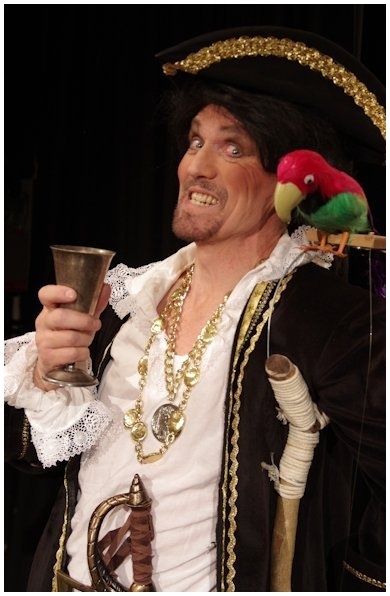 Doesn’t he mean, “pieces of eight”? Aaar, that were before Brexit! (Laughingly) Oh, I see. I bet he was expensive, then? Aye, that ‘e were, Jim. He cost me an arm and a leg! … Well, a leg, anyhows! (He gestures to his timber leg.) Parrots don’t go cheap, you know! No, they go “Aark!” instead! Well, shiver me timbers! Aark! But ‘e ‘ad nowhere to sit but the bottom of ‘is cage. Sick as a parrot, ‘e were! So, when I buys ‘im, I gets ‘im on ‘igher perches! Oh, I see what you mean – on hire purchase! Sharp as a cutlass, you are, Master James. Just like this old bird o’ mine – ‘e went to poly‑technic, didn’t you, Cap’n? Does he know his times-tables? Aye, lad – he can recite ‘em parrot fashion! … Bird brain o’ Britain ‘e were! And what do you feed him on? Shut yer bilge pipe, Silver! That’s enough of that, Cap’n Flint! Come on, let’s be ‘avin’ you back in yer cage. Jim lad, you go and see what’s ‘appening up on deck – I’ll be up in a jiffy. (As they exit) Stand by to go about! Pieces of eight! Shiver me timbers! Aark! 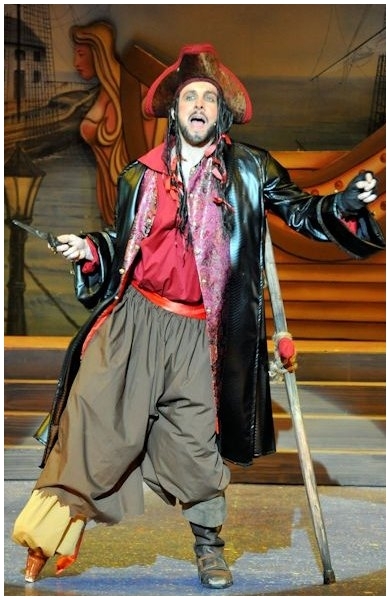 “… Everybody loves pirates and so a pantomime full of them is almost guaranteed to be a crowd pleaser! Alan Frayn’s version remains true enough to the source to make the story familiar whilst including all the ingredients essential to a good panto. The dialogue throughout the script is snappy and smart. There is some very impressive word play in the Dame’s early exchanges and an excellent running joke throughout about the size of her ample posterior! There is also a good amount of innuendo for the Dame to use. Audience interaction is very important in any panto and this script has ample occurrences of this. I particularly liked the page of suggested “ab-libs” for the Dame to use when getting the kids up on stage.